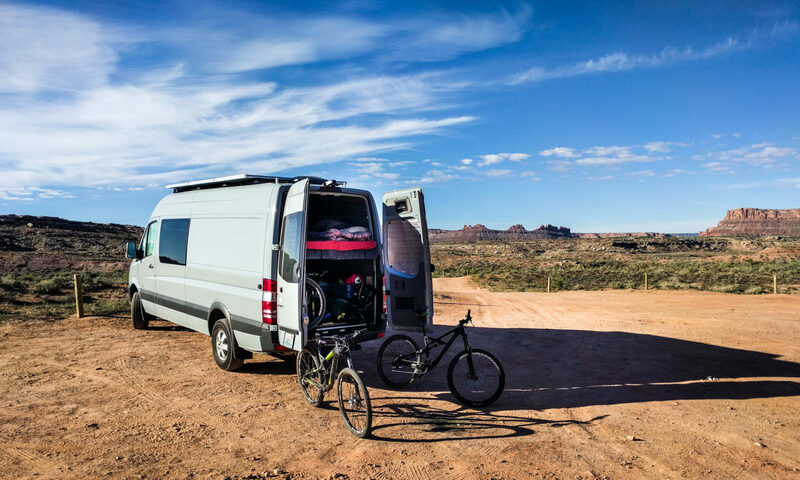 With the platform bed in the van, it’s almost impossible to open the rear door from inside the van. We drilled a hole in just the right place to let us get out in a hurry. It’s something that’s been bugging us for a while. If we’re in bed and for some reason we can’t get to the front doors, it’s almost impossible to open the rear doors. To solve the problem, we made a 4″ diameter hole in the area where our pillows are on the bed. It’s right over the door catch, and about 2″ back from the edge of the bed platform. It was an easy job with a 4″ hole saw drill bit (if you’re buying your first hole saw blade, you need an arbor for it too). 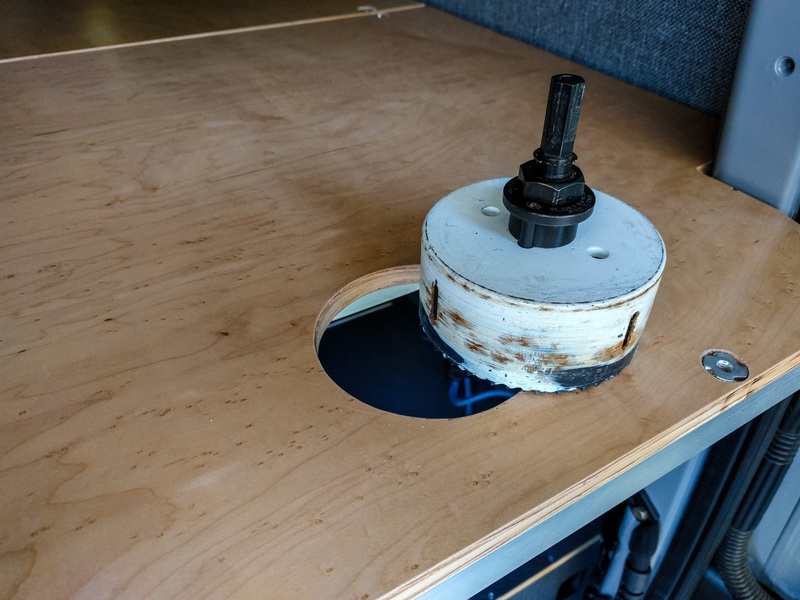 My 4″ hole saw has drilled through the van floor for the Espar heater, made holes in the wall panels for cable runs, and will soon be making holes for speakers in the panels at the back of the van. Use a powerful drill that can run the saw slowly. Hole saws have a tendency to catch in the wood, and then jump out of the hole. I know that because in this picture, the saw blade is handily covering up some tooth marks in the wood panel. With the mattress and pillow over that area, the hole isn’t noticeable. We can’t feel it when we’re lying on top of it. 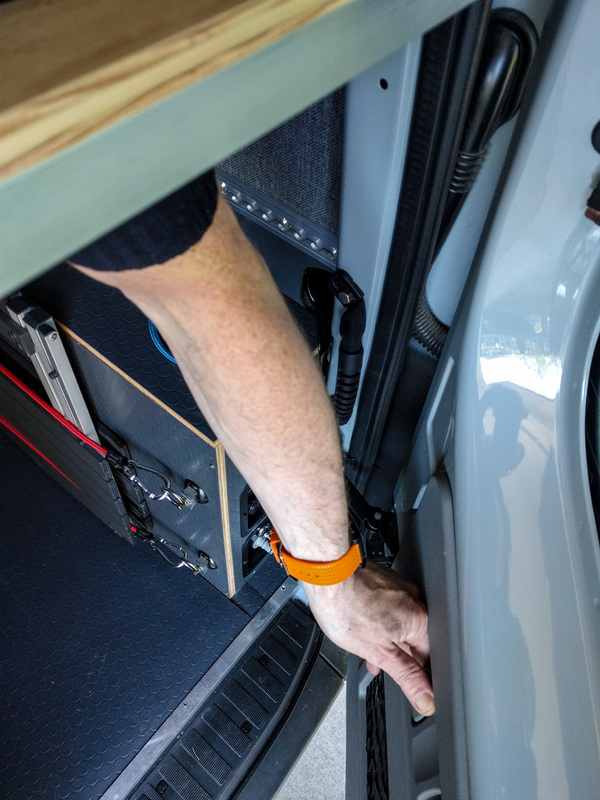 If we ever need to get out of the rear doors quickly, we can just pull the mattress out of the way, reach down, and release the door catch. Of course, there’s still the issue of jumping down from the bed platform to the ground, but overall that’s preferable to the potential alternatives.